Last edited by bbrmotosports; 03-01-2011 at 06:45 PM. thats awesome!! once i get mine done, ill measure the squish (i actually somewhat got what that other dude mentioned about the solder and stuff) and ill have to get mine shaved! is it a big improvement? Just got it together 20 mins ago, it's alot crisper thats for sure. I'll post after i ride. Thats all i use is solder to measure. You just gotta make sure you tell your machine shop what you want. Not just shaving the gasket surface. If you want the number to my machine shop pm me. lowering the roof and keeping the squish area the same will certainly raise the compression. old rule of thumb was to have 60 percent of your combustion chamber covered by the squish area, and 40 percent by the dome. if you want something higher reving you start working the other way, where more like 50/50 or 40 percent is in the squish and 60 percent is in the dome. this is one of my favorite parts of motocross. Remember that with increased Compression, you need to run higher octane that is more stable and more resistant to pre-igniting. 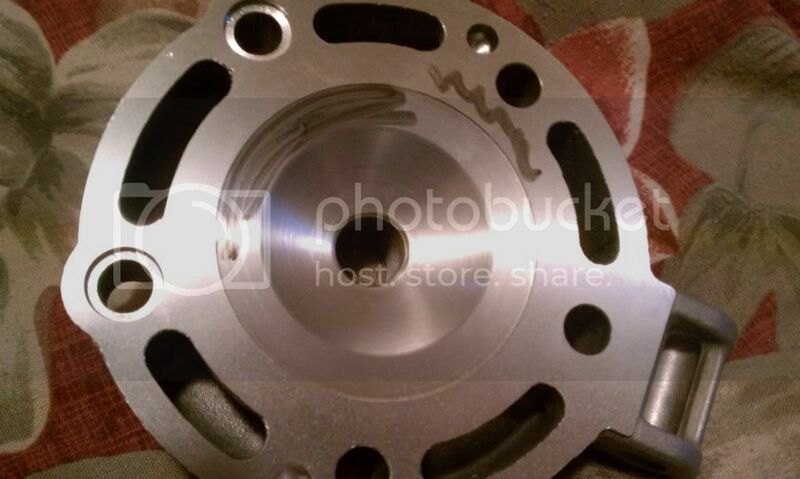 Also youd be best with adjusting the stator plate and adjust the timing for the fuel your running as well. ossagp Knows much, and respected for his knowledge. his thoughts on the dome are pretty square. alot of things can be done in this area of the motor. this area is everything for a two cycle performance motor. What are you trying to gain in the motorcycle? where do you want the power? what type of racing is the bike going to see? exactly, before i can shave my cylinder head first i need to knock the dents outa my pipe... looong road ahead of me, oh well!! and yes, ossagp is a very knowledgable trustworthy person, i can tell. I paid my guy $58.00. And i run race fuel. i have never advanced the timing yet. I'm going to wait until summer comes around since i can only ride indoors right now so i really cant be playing around too much.